Magento vs. Shopify: How to Decide? End of Life on Magento 1.x, and trying to decide between Magento 2 & Shopify? 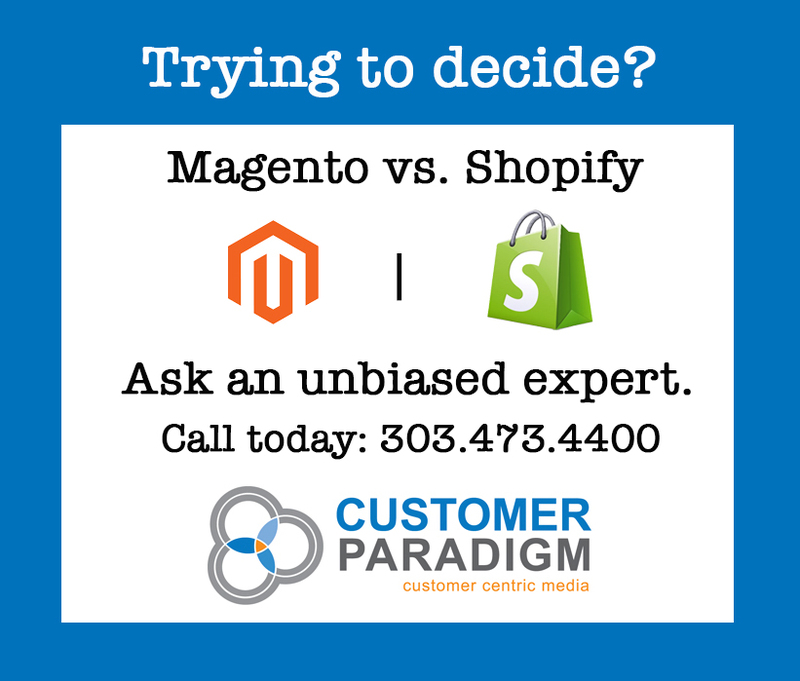 Shopify and Magento both have great advantages. Both can be powerful systems. If you’re looking for an unbiased opinion, contact Jeff Finkelstein, founder of Customer Paradigm, to review your options. eCommerce experts who care. Strategies that work. Hi, I’m Jeff Finkelstein. 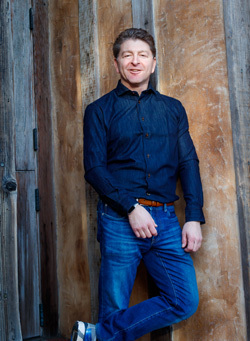 Founder of Customer Paradigm in Boulder, Colorado. Magento vs. Shopify. If you’re asking that question, I’m happy to help with an unbiased opinion. Usually, people who are asking this question are on the Magento 1.9 platform, or perhaps the Magento 1.14 platform. Maybe 1.8 or 1.7 Community, or even Enterprise 1.12 or 1.13. – Should you upgrade to Magento 2? – Should you move over to a SAAS system like Shopify? – Should you just keep holding on to your existing 1.9 site as long as you can? – Should you close your site, and just sell on a third party marketplace like Amazon, Jet or eBay? – Should you even be in the eCommerce space at all? I’m happy to help you decide. I founded Customer Paradigm in 2002. I’ve helped build eCommerce sites on OS Commerce, Woo Commerce, WP-Commerce, Magento, Shopify, Big Commerce and more. Way, way back when, I built a custom eCommerce platform called PageDirector, which I used for the DiscountDecorating.com site. That was later sold to Blinds.com, which was then sold to HomeDepot.com. I’ve been in the space for a while. I’ve been to almost all of the Magento Image trade shows. I’ve been a featured speaker at them, had a trade show booth there. Certainly drank a little too much a couple of times in Vegas. But I’ve been through all of Magento’s training programs. Like anyone in the space, I’ve banged my head against the wall trying to figure out how to make Magento sites work well, starting starting back on the 1.4 platform work. We’ve upgraded 1.3, 1.4 sites, worked with 1.6, 1.7, 1.8 and 1.9 sites that are facing the end of their life soon. I’ve worked with Magento Enterprise sites, and Magento’s professional platform. We even spent time working on Magento Go. That was fun. I’ve been a Magento partner since 2010, I believe. Back in the Roy Rubin and Mark Schwartz days. Before the eBay purchase, before they were spun on with private equity, and before the Adobe acquisition. My company also knows Magento 2. I’ve gone through all of the training, and my company has been certified as a Magento 2 certified solution provider. It’s a pretty slick system, but it has it’s own fun, too. In 2016-2017, my company invested over 10,000 hours of development – that’s five people working for more than a year – to build a really amazing integration for Magento 2 to an external system. I can’t get into all of the details, but I sold that product before it went onto the marketplace. The main reason: Magento adoption was not as fast as I was expecting. Fast forward to now. My company is also a Shopify partner. And Big Commerce, too. I’ve gone through all of the training for Shopify, and it’s a pretty slick system. A lot of the headaches of a Magento site – like security, upgrades, site speed, etc – that just goes away on a SAAS platform. Having to worry about paying a hosting company, and core code, that’s no longer a thing. You can spend that money working on marketing, merchandising, and customer acquisition. I’ve helped move sites from Magento to Shopify, and from Shopify over to Magento. Both are great platforms, and both have great advantages. And at the same time, both of them have their severe limitations. Here’s the dirty secret. I’m partners with both Magento and Shopify. Both of them want me to tell you that their platform is the best. Okay. I’ll start with why Shopify. If you don’t have a lot of products, and your integration needs are small – you’re not trying to tie into a legacy ERP system, or you don’t need help with inventory synchronization, etc, Shopify can be a great way to go. There’s a lot of pre-built themes, and it can be quick, fast and easy to get something up and running. I built a fully working Shopify site in just a few hours. I already had images, and I used one of their pre-built themes. I didn’t have to use the command line, or install software. I just created a demo store, and did everything from the browser. Pretty cool. That said, there’s a lot of limitations, too. If you have a highly customized user experience, and you want to do something that isn’t part of the Shopify code base, it’s much more challenging to get it done on Shopify or Shopify Plus. For example, on a normal Shopify site, changing how discounts are displayed on a mini cart or the cart page is not easy. It can be done, but it takes a lot of heartache to make it work. On Magento, it’s pretty simple. If you need complex B2B functionality, you need multiple store fronts with a common back end system, or you’re trying to integrate with an expression engine front end, then Magento is probably a much better platform for you. If you need a seamless integration with a POS – point of sale – system for your retail store, and your products are not very complex, then Shopify might be a good way to go. Its system is pretty slick. If you need complex shipping rules, or sell in a restricted category – think medical MMJ or guns or other stuff – Shopify won’t touch it, and Magento is going to win out. I could go on and on about some of the differences. – If you have simple needs, products that are not complex and not a lot of integration, then Shopify is a great platform for eCommerce. – If your products are complex, you need lots of B2B or complex functionality, and you want to customize the end user experience to your business needs (instead of changing your business to fit within the Shopify framework), then Magento is a better solution. – Not have to invest in security patches, upgrades or worry a lot about the underlying code base. If you’re worried about getting hacked, Shopify takes this on for you. – Spend more time on digital marketing and content. – You won’t have to worry about server scalability. On Magento, one of the things is that if you get a sudden 10x spike in traffic, your servers may not be able to handle this. I know. I’ve spent a lot of late nights at the office fixing this specific issue. Shopify is hosted and auto scales, so this isn’t an issue. Yes, you can build an auto-scaling Magento system, but this isn’t easy to do, and often can fail spectacularly at the exact wrong moment – when a ton of people want to buy your product. – Customize the end user experience, work with complex products and integrations. You have full control over the code, and you can make it do exactly what you want. – Magento 2 can be wicked fast. If you set it up right, it’s like running a highly tuned sports car. The performance can be amazing. But, Shopify is going to take a percentage of sales. Magento’s Enterprise / Commerce platform sort of does this as well, because their pricing is based on a tiered pricing structure. Magento 2’s free, open source software doesn’t have this cost component. Although you’ll still need to pay for a payment gateway, such as Authorize.net, or Pay Flow Pro, and that takes a little bit out of the process. Magento 1.9 – the end of life is right around the corner. I’m sure that some of the sites that are on the 1.x platform will just stay on it. The risk, though, is that security holes are often found, and if Magento is not releasing new patches, that makes it a lot more challenging to keep your site from being attacked. I know. We tend to fix a lot of Magento sites that have been hacked or attacked in the past. The other risk is that most Magento extension developers are not doing anything new on the Magento 1.x platform any more. There’s still some, but what can happen is that functionality breaks when people change things. For example, last month, Authorize.net made a small change to their API system. Magento 2 users were not affected. But it wreaked havoc on Magento 1.x site owners. Basically, people were putting their credit cards into the system; the card was being charged, but Authorize.net was returning a message saying that the payment didn’t go through. If UPS or USPS or FedEx makes a shipping API change, then stuff on the 1.x platform is just going to break or stop working. So, which is better? Magento or Shopify? The answer is both. Or neither… Ten years ago, Amazon was just get started. Now it’s 50% of all eCommerce traffic. They have more than 42% of US households as Amazon Prime members. The world is a lot more competitive and complex than it was before. But I’d love to help and answer your questions. Give me a call at 303.473.4400 and let’s talk. Or contact me through the form on our site at www.CustomerParadigm.com. I’m happy to give you a really unbiased opinion. And if you want to work with my team at Customer Paradigm, we’d love to be part of the process of building your site, and then helping you with digital marketing. Helping with product photography, creating compelling content. And if not, there’s no obligation. If you’re on the Magento 1.x platform, we have a code audit tool we can run that will give us a health status update on your system. I’m happy to run that for you, as well as do a non-invasive external security scan at no charge. My favorite part of the day is talking to eCommerce site owners like you to discuss your business. I love hearing from people on why they started an eCommerce site. It’s really fun. The name of my company, Customer Paradigm, was based on the assumption that end customers increasingly have control over their purchasing experience. Buying online, interacting with people based on interest instead of geography – all of this was made possible by the Web. If you’re like me, you’ve made your fair share of mistakes over the years. I won’t just share my successes with you; I’ll share where I’ve screwed up, too. So that I can help you avoid that in the future. So… give me a call. Let’s talk! My phone # is 303.473.4400 or contact us through our site – www.CustomerParadigm.com. Based in Boulder, Colorado, we are happy to review your current site at no charge – we’re here to increase your eCommerce sales, conversion rates, and overall revenue. My passion is helping eCommerce businesses like yours leverage the power of the Web to aggregate customers according to interest, and not geography. 12,600+ projects later, I still love what we’re doing, and I love that the premise of the company – customer-centric thinking – is still just as valid and relevant today as it was back in 2002. Back then (before Facebook, Twitter, YouTube, the iPhone, Amazon Prime, Gmail, Magento or Shopify), I saw that the companies that were succeeding online were the ones that were focused on the end customer experience.